The Sworn Virgin is Blessed Unrest's second original, bilingual (English/Albanian) collaboration with Teatri Oda. This fall we finished developing the play and performed at Teatri Oda, then toured in Kosova, Macedonia, and Albania. We are planning a New York production in 2014. For stories, video, and photos of our adventure, check out our blog. The Sworn Virgin is based on the ancient Albanian tradition now beginning to vanish, in which women take, or are forced to take, an oath of lifelong celibacy in exchange for the rights and responsibilities of living as men. In the play an aging cobbler in a mountain village is losing his ability to work while becoming obsessed with his collection of guns. His only son comes home for a visit with his new American wife bearing news that puts the family in a financial crisis and pushes his sister to make a shocking decision. Meanwhile Madeleine Albright is in town for the unveiling of a statue in her honor, and when an American soldier and a love struck New York Times reporter arrive on the scene, chaotic misunderstandings abound and secrets are revealed. We believe that artistic collaboration has the power to break down cultural barriers and build international bridges, and we’ve been collaborating with Oda since 2005. Our last play, Doruntine, was widely acclaimed in New York and on our 2009 Balkan tour. This project is supported by grants from CEC ArtsLink, US State Department Embassy in Prishtina, Kosova Ministry of Culture, and by the generosity of individual donors. At the annual Innovative Theatre Awards ceremony on Monday, September 30, 2013, Jessica Burr and Sonia Villani were honored with the New York Innovative Theatre Award for Outstanding Choreography/Movement for our original devised play Eurydice’s Dream. Lovers are torn between two worlds, lost and found in a desolate land, and shaken to the core by a shocking encounter. 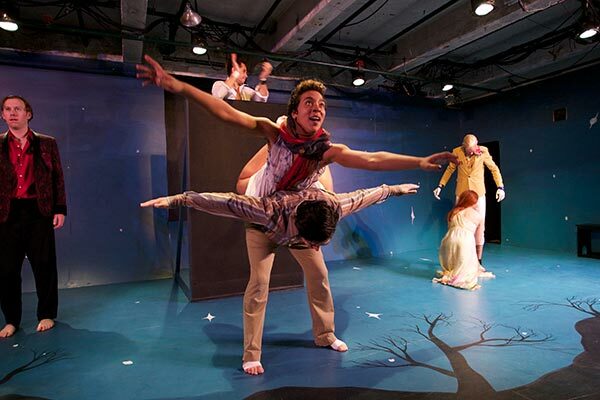 Eurydice's Dream is an original piece conceived by Blessed Unrest's award-winning Artistic Director Jessica Burr. Rooted in the myths of Orpheus/Eurydice and Echo/Narcissus, the multiple narratives of wayward love are woven together with humor, precision, and sweat. Fresh from our acclaimed international tour of the Balkans, we dove into the physically-driven process of creating Eurydice's Dream. The writers, director, designers, and our diverse, multitalented cast are vigorously collaborating, building a work that is strikingly beautiful and emotionally powerful. “Blessed Unrest's original creation Eurydice's Dream is a powerful abstract journey. There is far more dance, emotion, movement and skin onstage than text. I love the physical ingenuity and visual artistry of this company’s work, and this show lived up to my high expectations. “The physical energy onstage is incredible. There are always bodies moving in creative and captivating ways. It's deliciously overwhelming to try to take it all in. “Perhaps the biggest reason to see this play is to behold how strong each member of the ensemble is individually and how bravely they work together. Their bodies are ridiculously dexterous and they deftly handle each other's bodies like magical extensions of their own. “It's tremendously impressive. …from beginning to end one never wants to stop looking—even blinking at Eurydice's Dream seems a nuisance. “It's to the choreographer's credit that much happens at once in Eurydice's Dream but one can take it all in—there are no conflicts about ‘where to look’ as in a multi-ring circus, it's all there for you as if it's all a part of you. Eurydice's Dream has been made possible by SHS Foundation; the New York State Council on the Arts with the support of Governor Andrew Cuomo and the New York State Legislature; the Manhattan Community Arts Fund, supported by the New York City Department of Cultural Affairs in partnership with the City Council and administered by Lower Manhattan Cultural Council; the Interart Theatre Development Series; and the generosity of individual donors. In the spirit of our past Come If You Dare experiments, 400 Parts per Million is a savage and exuberant exploration of a love nearly missed. We invite you to catch a glimpse of work-in-progress on this new ensemble-built creation.